This popular film inspired a whole new generation of Americans to take up the martial arts in a similar pursuit of the same ideals personified by the film’s young and ostracized central character, Daniel (Ralph Macchio). Many of the film’s most important scenes have now become iconic: wise Japanese sage Mr. Miyagi (Pat Morita, from TV’s Happy Days) catching a fly with his chopsticks, the “wax on, wax off” scene, and that famous jumping crane kick at the end, all of which now seem to exist extraneously and embedded on the public conscious. Director Avildsen designed the film to be enjoyed by a younger audience – the kids who missed out on his Oscar-winning 1976 boxing film, Rocky – and in doing so, the film nobly follows the codes of the underdog sports drama to satisfying and rousing perfection. Macchio plays the American every-boy with great charm. As New Jersey-born Daniel, he settles with his single mother in a Californian surfer town and immediately makes enemies in the form of spineless school bullies and their ex-army karate teacher, John Kreese (Martin Kove). 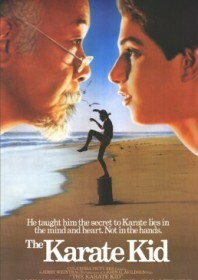 Mr. Miyagi, the boy’s philosophising plant-loving Japanese neighbour, steps in to teach the kid some karate through the medium of DIY, creating one of martial art cinema’s most memorable on-screen instructors. Daniel is soon ready to face his tormentors at a karate tournament once all known clichés are exhausted (training montage; tender girlfriend subplot; debilitating injury and eventual comeback). Despite its predictability, this is still a film with a lot of heart, most notably in the relationship between teacher and pupil, and paints its morality in broad enough strokes for even the most jaded of viewers to be convinced. It’s really good fun, too.